The Society for Ethnomusicology is currently collecting news items to include in its online repository: applied project news, educational outreach program news, organizational endeavors, and research projects. We are grateful to and inspired by the Society for Ethnomusicology and their thoughtful attention to connections between music and social justice. The Society for Ethnomusicology’s Music and Social Justice Resources Project is a repository of material on how people worldwide are currently using music to address issues of social conflict, exclusion/inclusion, and justice. We welcome notices on public events (e.g., rallies, performances, conferences) and other general news; proposals/reports on projects involving community engagement, activism, or advocacy; syllabi, lesson plans, and other educational material; information on activist organizations; and research articles. To submit initiatives related to music and social justice for inclusion in the online repository, go here and follow the online instructions. Where war has raged, people need everything to return to life: food, water, shelter, clothing, medicine. But more than anything, people need hope. To reconcile, people need empathy. To heal, people need connection and community. Music creates empathy, builds connection and gives hope. Rwanda Youth Music is one of many of Musicians Without Borders’ projects. 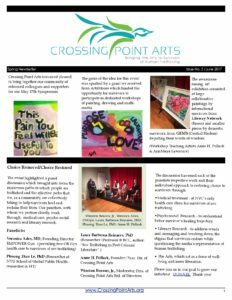 Crossing Point Arts was founded by a small group of New York City activist artists. This group came together to offer their hearts – and their art forms – to survivors as a step towards managing Post Traumatic Stress Disorder (PTSD). In workshop format, participants have the opportunity to be guided by Teaching Artists and Expressive Arts Therapists in singing, song-creation, dance, visual arts, poetry and theater. In Artistic Citizenship, Aria Fani examines Persian literary cultures, specifically in Afghanistan. For Fani, and for Persian peoples, the Soviet invasion of Afghanistan (1979-1989) ignited a heightened awareness of concepts of citizenship, homeland, and exile. In the absence of a centralized political body in Kabul, Persian poets expressed variegated narratives of what constituted Afghan “identity” and loyalty to the nation. an oral and often anonymous scrap of song created by and for mostly illiterate people: the more than twenty million Pashtun women who span the border between Afghanistan and Pakistan. Traditionally, landays are sung aloud, often to the beat of a hand drum, which, along with other kinds of music, was banned by the Taliban from 1996 to 2001, and in some places, still is. Travelling in Afghanistan, Griswold collected numerous landays for the book I Am the Beggar of the World: Landays from Contemporary Afghanistan. And since then, the New Zealand born composer Gemma Peacocke has set these two-lined poems in the multimedia work Waves + Lines for soprano, chamber ensemble, and electronics. Mixed and mastered by: Gregory Wayne Hanson Jr.
willful intimidation, physical assault, battery, sexual assault, and/or other abusive behavior as part of a systematic pattern of power and control perpetrated by one intimate partner against another. It includes physical violence, sexual violence, psychological violence, and emotional abuse. The frequency and severity of domestic violence can vary dramatically; however, the one constant component of domestic violence is one partner’s consistent efforts to maintain power and control over the other. Domestic violence is an epidemic affecting individuals in every community, regardless of age, economic status, sexual orientation, gender, race, religion, or nationality. It is often accompanied by emotionally abusive and controlling behavior that is only a fraction of a systematic pattern of dominance and control. Domestic violence can result in physical injury, psychological trauma, and in severe cases, even death. The devastating physical, emotional, and psychological consequences of domestic violence can cross generations and last a lifetime. interviewing domestic violence survivors at shelters in Miami, Hartford, New York, Chicago, Los Angeles, Portland, South Carolina, and Washington, D.C. After filming only their mouths to keep the women anonymous, Del Buono created an installation of 20 small monitors with the lips of the survivors speaking of their personal experience. When viewers walk into the exhibit, the multiple voices create a symphony of unrecognizable words. Only when you approach an individual monitor do you hear their personal and traumatic stories and how they have gotten out of their situations. The necessity of this movement on the part of viewers acts as a metaphor: only when one gets close do they learn of the individual’s traumatic experiences. As a society, we must not allow the epidemic of domestic violence and those who are affected by it to remain an invisible, inaudible crowd of statistics. Voices has travelled across the United States, and was recently exhibited at Blue Sky Gallery, Bronx Museum, Winthrop University, Art Palm Beach, and Museum of Contemporary Art in Miami where it was accompanied by a panel discussion open to the public. Local NPR radio host Bonnie Berman moderated the panel consisting of domestic abuse survivor, a local advocate, teen violence advocate, the museum’s director of international programs, and Del Buono. 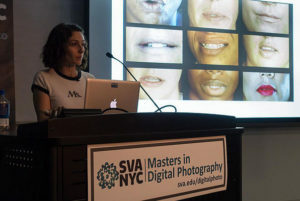 Del Buono received a BA from Boston College, an MFA from the School of Visual Arts, and attended the graduate film program at NYU Tisch School of the Arts. Trained as a photographer and filmmaker, Del Buono creates video installations and public happenings. She incorporates performance, interactive video, and humor as ways to engage and impact her viewers. What responsibilities do artists have to engage in art work for social transformation? Founded by Hank Willis Thomas, a photographer and conceptual artist, and Eric Gottesman, a video artist and activist, the super PAC is named after Franklin D. Roosevelt’s “Four Freedoms” wartime address in 1941 — a call to safeguard the freedoms of speech and worship, the freedom from want, and the freedom from fear. Contributing artists and photographers include Carrie Mae Weems, Rashid Johnson, Xaviera Simmons, Alec Soth, Bayeté Ross Smith, Fred Tomaselli and Marilyn Minter. Their works will be used for billboards, building signs, subway advertising, Internet memes, social media and select print advertising, potentially even yard signs, and ultimately an art show at the Jack Shainman Gallery in Chelsea. As the first artist-run super PAC, For Freedoms uses art to inspire deeper political engagement for citizens who want to have a greater impact on the American political landscape. We believe that artists, and art, play an important role in galvanizing our society to do better. We are frustrated with a system in which money, divisiveness, and a general lack of truth-telling have stifled complex conversation. We created the first artist-run super Pac because we believe it’s time for artists to become more involved in the political process. What can we learn about the role of art in politics from For Freedoms? We leave this up to you to decide. For now, we urge you to think-through today through the lens of the actions and activism of For Freedoms. A Jim Goldberg photograph from the Postcards From America series. 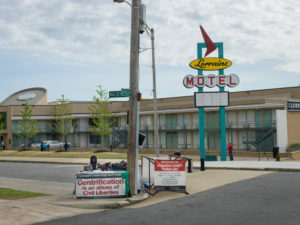 Jackie Smith, protesting gentrification in Memphis, at the site of the assassination of the Rev. Dr. Martin Luther King Jr., now the National Civil Rights Museum. Video projections are embedded in the center of an elaborate set-piece, playing a personal and imagistic role in the work. Performed with live music, including Ms. Brenner on vocals. Janis and I conversed about things that interested us and empathy came up right away, as did the need to really hear one another. I spoke about walking in someone else’s shoes – feeling wise – and how that impacts the strangeness in any relationship…Visually, the piece unfolds in wavy patterns which “freeze” on occasion, or so was our intention. There is a hanging set piece onto which video is projected in the same fashion. With each unfolding, messages becomes clearer, there is a shedding, a letting go, a cutting into deeper layers of pain and, yes, beauty and goodness which lurk in all of us. Like taming a wild animal, the piece comes to terms with its audience. The music is complex and electronic at first, then becomes gradually acoustic, with a string quartet, then a voice, a scrape of a shoe, and into silence. Art-rock-meets-electronic experimental-meets-old world sentimental. For more information on the premiere, visit Gibney Dance. In the mean time, watch the ETHEL String Quartet perform an arrangement of this work. The following segment was performed as part of Composers Concordance’s Roundtable concert at (le) Poisson Rouge on January 26th, 2017. Thank you, Michael Bussewitz-Quarm, for your support of our book. Yes, collective singing — all collective music making — is a powerful and potent source of good depending on the contexts and circumstances of the musicing. Because of this, thank you in advance for your “Concert for Peace”! What happens to us when we actively engage as art-makers or art-takers? Who do we become? 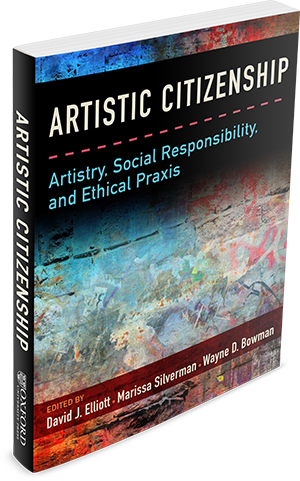 Given the complexities of today’s political, social, and emotional landscapes, engaging with/through the arts is as important now more than ever. Why? 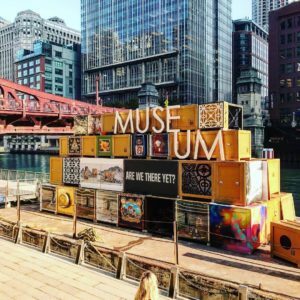 “With everything that’s going on in the world, it’s easy to question the value of telling stories or making sculptures.” While some may be tempted to question the arts at times like these, we disagree. And so does Miguel Syjuco. “Silence, it is said, implies complicity. But that’s only half the story. Silence also confirms oppression, because the ability to speak out is too often a luxury of the privileged. Art making and art taking help us raise our voices to the level of consciousness. The arts confirm that we do not need to remain silent and complicit.